or like a person battling Parkinson’s. my hands to punctuate each inner whatever. me unable to afford my meds. but the final word heard before the trauma. again and again. Again, I tsk and shake my head. its plush neck, spinning amidst cottony innards. could budge him, even then, leaving the bones. regarding me from behind shut eyelids. I position myself to be seen. Devon Balwit teaches in the Pacific Northwest. She has six chapbooks and three collections out or forthcoming, among them: We are Procession, Seismograph (Nixes Mate Books), Risk Being/Complicated (A collaboration with Canadian artist Lorette C. Luzajic); Where You Were Going Never Was (Grey Borders); and Motes at Play in the Halls of Light (Kelsay Books). 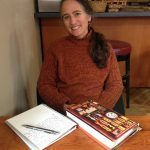 Her individual poems can be found here in MER as well as in The Cincinnati Review, apt, Posit, The Carolina Quarterly, The Free State Review, Peacock Journal, The Ekphrastic Review, Eclectica, SWWIM, and more.